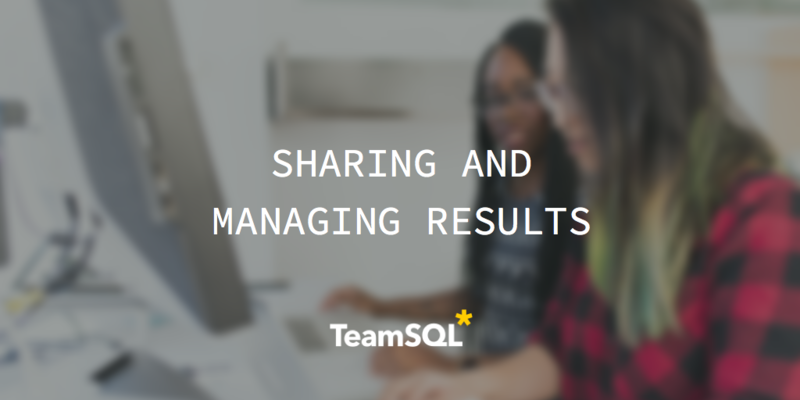 TeamSQL allows you to share the set of data returned after you execute a query via hyperlink. This means that you can share this data with somebody regardless of whether the person uses TeamSQL or not. The user to whom you’re sharing simply navigates to the URL you provide to see the data. Before you can share your results, you’ll need to execute a query to return a set of data. Once you’ve returned a set of results, you can right-click and select Share to > Get URL. TeamSQL will then prompt you for some basic information about your data set. Encryption: Whether you want your table encrypted or not; if so, you’ll be askedto provide a password you need to manuallyshare with your recipients. Please note that we cannot retrieve lostpasswords. Expire in: The amount of time before the link expires. When you’ve provided the requested information, click Create Link to proceed. You’ll be shown the URL TeamSQL generates for your data. Click Copy & Close to copy the link (which you can then paste elsewhere) and close out of the dialog box. Using this link, you (or anyone with access to the link) can navigate to the data set using an internet browser. If you chose to encrypt your data, the viewer will be prompted to provide the password before they’re shown the data. Those who successfully view the data can continue to refer to the data set in the browser, or they may choose to Export to PDF or Export to Excel. If the user doesn’t already have a local copy of TeamSQL, they can download one using the provided link. You can easily manage the results set that you’ve shared with others. To see a list of URLs that are currently active, go to File > Shared Results. You’ll see a dialogue window pop up with the title of your link, the date created, and its expires on value. You can also use the Browse feature to go directly to the URL. You can click Edit next to your link to edit/update its title, description, and expiration date. When done, click Save to proceed. You can delete a URL before it expires (URLs that expire are automatically deleted by TeamSQL). Simply click Delete next to your URL and confirm the deletion. You’ll no longer see the link displayed in your list.